Carrot is very much good for health, we do make varieties of foods with this mildly sweet vegetables. Even this vegetable suits prefectly for making incredible bakes, muffins with carrot makes an excellent breakfast or snacks depending upon your wish. 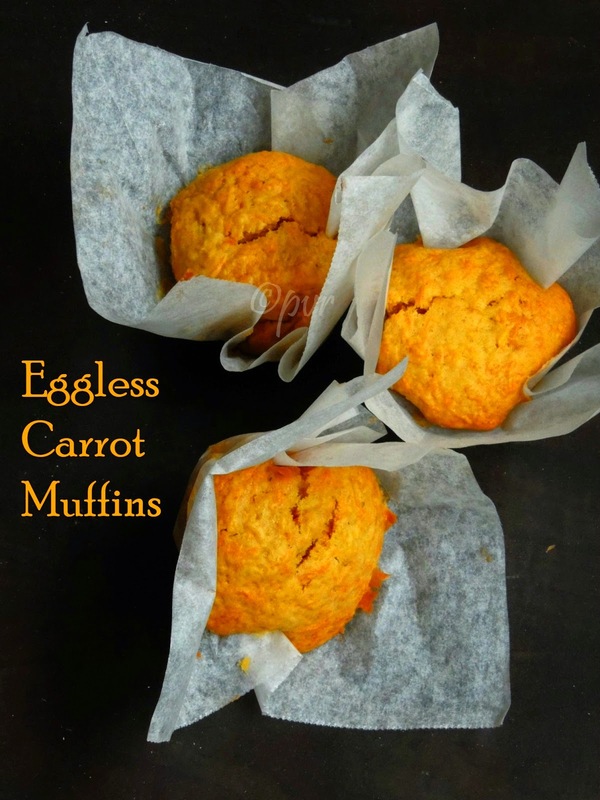 Carrot muffins are very easy to make and these muffins are completely eggfree and butterfree, so you have this muffins without any fuss. You would have already seen carrot with cream cheese frosting. But my today's post is quite different, no frosting, no spices like cinnamon etc. So this muffins is seriously one of the easiest muffins i have ever baked. Instead of baking the muffins with muffin moulds or with muffin paper cups, i used baking paper for this muffins. Actually i baked this carrot muffins with baking paper for this week's blogging marathon theme as am running with cooking substitution. 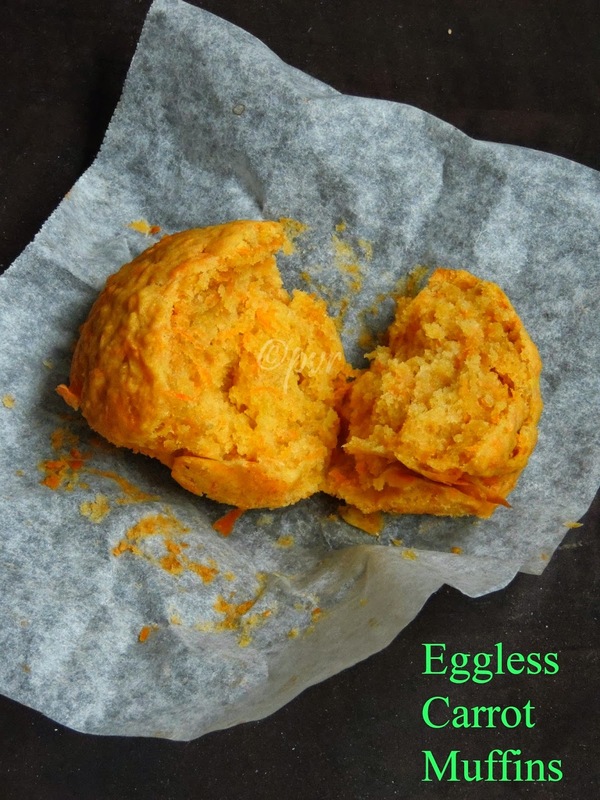 Here in this recipe, i substituted muffins cups or moulds with baking paper. How to make this, just you grease a stainless steel glass or a muffin tray,now place a rectangular baking paper inside the glass or muffin tray, pour enough muffin batter and bake it in oven. Thats all, how easy na. 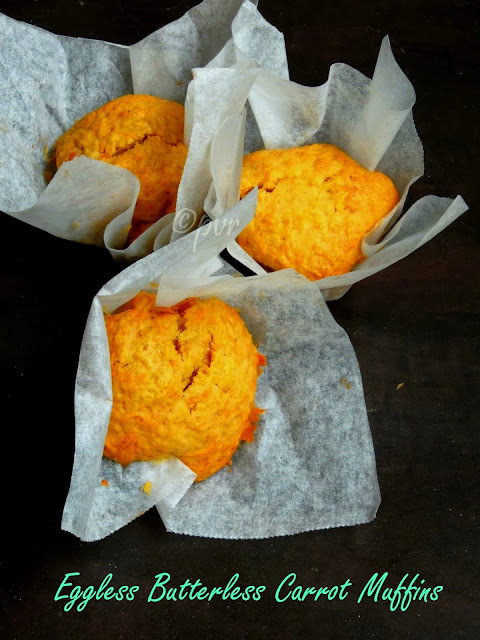 May be shape of the muffin can be bit different from the usual ones but still if dont have or you ran out muffins papers, just replace it with baking paper and go on with your baking.Check out the Blogging Marathon page for the other Blogging Marathoners doing BM#52. In a bowl, sift the flour,baking powder,baking soda and salt. Meanwhile in a small bowl whisk together the sugar,honey, yogurt,grated carrot,oil and vanilla extract. Pour the wet ingredients to the dry ingredients, whisk lightly. Dont overmix the batter. Spoon the batter evenly to the already prepared pan. Transfer to wire rack and cool it. Carefully remove the muffins from the pan, cool completely. Baking method sounds interesting..can you use stainless steel in your oven?.. Interesting idea. The muffins look just as good as those baked in a cu. Nice color of the muffins and very spongy too. That is a cool idea, Priya. Love those muffins. Using parchment paper is a neat idea instead of paper cups. Carrot muffins look yummy!! Muffins look moist and fluffy.